Electronics Costs > How Much Does a Mechanical Bull Cost? How Much Does a Mechanical Bull Cost? A mechanical bull is a machine that replicates the sensation of riding a bucking animal such as a horse or a bull. This machine is powered by a motor and its speed can be adjusted depending on the preference of the rider. The mechanical bull is usually surrounded by a padded flooring that can prevent injuries if the rider falls off the machine. The price for a mechanical bull depends on the material being used, the size of the machine and the company selling it. On average, a mechanical bull can cost anywhere from $3,500 to as much as $11,000, depending on the factors mentioned above. 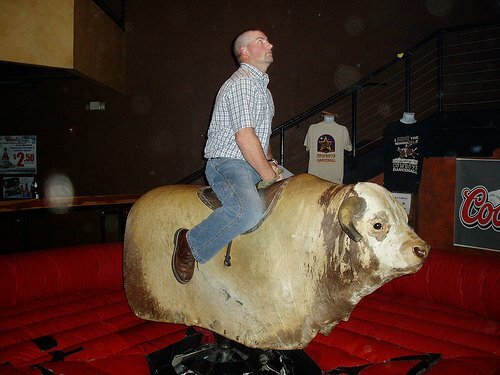 Renting a mechanical bull monthly can cost anywhere from $350 to $550 per month. For example, the mechanical bull manufactured by USAJumping.com retails for $8,900. MechanicalBullSales.com, an online retailer, offers different types of mechanical bulls with different designs, ranging anywhere from $2,000 to $10,000. MechanicalBulls.com, for example, leases out its mechanical bulls for $500 to $650 per month. They offer free delivery as well as free installation for the mechanical bull. All of the tools and accessories needed to operate it will come included with purchase or rental. It will have a control station where the operator can control the speed and power of the machine from a distance. Speeds can generally be controlled at 10 different speeds and most models will run on a small three to 15 horsepower motor. Depending on the company, the bull may have a built-in padding area, similar to an air mattress, surrounding it, equipped with an air blower. Higher quality mechanical bulls may have pre-set rides installed on the control panel, along with built-in speakers, microphones, and music and video inputs. While most will plug into a standard 110-volt socket, some may require a dedicated 220-volt line. For commercial usage, a separate liability insurance policy is something to consider. If the bull doesn’t come with an air mattress, a customized or standard size will be required. These mattresses should be double stitched, fireproof and will have side walls that measure at least two feet in height. Due to the size of these bulls, additional shipping expenses may be applied since it can’t be shipped via most traditional shipping methods. Mechanical bulls will usually require an area that’s at least 20 by 20 feet and ceilings that are at least 12 feet high. Based on the model you purchase, you may need a separate breaker to run a dedicated 220-volt electrical line. Due to the size, a door wider than 36 inches may be required. Mechanical bulls can be rented or purchased. If you are not going to use it often, you may want to consider renting the machine rather than buying it. By doing this, it will help you save on maintenance costs as well as avoiding to pay the full price of the machine. It can also give you the opportunity to test it to see if it’s something you want to invest in. Highly consider purchasing the machine used. Sites such as eBay have a selection of bulls starting at $1,000. If purchasing a bull using this route, be sure to include the shipping costs. If you’re going to pick it up in a local area, be sure to look at the weight of the bull to ensure that you’ll have enough people to pick it up as well as load it up. It’s also best to try it in person to ensure that it works. Financing options can be available through some retailers. I used to have a bull from Galaxy but it had a lot of issues. I have since purchased one from MechanicalBullSales and it is far superior. I went to IAAPA and checked out all of the options and rode them as well before making a decision. This bull is low maintenance, built amazingly well and very safe.